"A Secret IRS Regulation That Is Your Key To Tax-Free Wealth"
Did you know there's a secret IRS regulation you can use to get rich without pay taxes on your newly found wealth? Don't feel left out of the loop if you didn't because this secret is one most CPAs aren't even privileged to. Not only does this "secret regulation" truly exist, but you can also use it to pass your tax-free riches on to your children and grandchildren. No, this isn't some defiant, tax-protest fantasy or Caribbean offshore scheme designed to cheat the IRS, nor is it some vague loophole the IRS hasn't yet closed. All of those things will eventually get you in trouble or eventually land you in jail. What I'm about to reveal to you is perfectly legal, in fact, encouraged by the United States government itself. My name is Ron LeGrand, and as you may or may not know, I've been in the business of teaching people how to get rich in real estate for over 27 years. I've bought and sold over 1,600 homes for profits that have made me a millionaire. I'm also known as the "Millionaire Maker" because I not only do I do what I teach, unlike most of the other so-called "real estate gurus", I help my students experience similar success using my secrets and Systems. Using my unique methods and techniques, hundreds of my students have risen from humble beginnings, as I did many years ago, to create wealth out of thin air and profit wildly using none of their own money, only what I teach them. There is, however, a problem when you become this successful. When you start making money, especially in real estate, Uncle Sam comes calling, and you have to constantly write him big, fat tax checks, a painful experience at best. I know because I’ve personally written him some big ones over the years. Heck, I’ve probably funded the entire US Congressional payroll. While I’m a law-abiding citizen and grudgingly pay my taxes on time each year, I’m only interested in paying what’s legally owed and not a cent more. I’m a firm believer in President Eisenhower’s philosophy that it’s the duty of every American to pay no more in taxes than what he or she owes legally. In my quest to live up to my patriotic duty, I talked to every tax expert under the sun, but no matter which expert I talked to, I always felt like I was overpaying. So I set out on a mission…a mission to discover how I could legally pay the absolute bare minimum in taxes or maybe even no taxes. Back in 1997, Congress, in a rare stroke of genius, passed what they called the “Taxpayer Relief Act.” Hidden in that act was a provision by the then Senate Finance Committee Chairman William Roth that created a new kind of IRA (Individual Retirement Account) designed to encourage more savings among Americans. Unlike a traditional IRA where you get a tax deduction on the money you contribute and pay taxes when that money comes out, the Roth IRA works just the opposite. You don’t get a tax deduction on any contribution you make up to $5,500.00 a year depending on your current income; but you also don’t have to pay taxes when you take money out, and it grows tax free inside your IRA. Here it is: Your Roth IRA can be “self directed.” I realize that at first glance, that secret may not sound like a big deal to most people, but to the smart real estate investor, i.e. the one who follows what I teach, it is a big deal, a HUGE DEAL. One that can effortlessly make you rich! Here’s why: The way the law is written, you can only contribute up to $5,500 a year, BUT you can make as much money within your IRA as fast as you want by controlling HOW you invest the money. If you still aren’t jumping out of your seat with excitement like you should be, let me give you an example the “Average Joe” has no clue about. Most people listen to their accountant or financial advisor, as they think they should, and put the money they contribute in their IRA into stocks or mutual funds that grow at wimpy rates of return, or in recent years not at all. Even if you’re putting away the maximum contribution every year, it takes a long, long time for it to grow into anything substantial, even though it grows tax free when you’re investing in stocks, bonds and mutual funds. Pathetic and irritating, huh? it makes a tiny investment in a house, I recommend $100, then you turn right around and sell that house, turning a huge profit (the average profit my students make in the “pretty house business” is $35,000.00 by the way). Since it’s an investment by your IRA, not a personal contribution, that money goes right back into your IRA, TAX FREE, FOREVER. Think about that for a second…. how many real estate deals like that do you have to do to absolutely flood your IRA with enough tax-free cash for yourself and your family? How many times do you have to invest $100 to make $35,000.00 to pay your children’s and grandchildren’s college tuition? Not many! In our example, the Average Joe following the advice of his financial advisor invests $100 and, if he’s lucky, gets back $112 in a year, and that’s at a good 12% return rate that is unheard of during this recession and less commissions, of course. The savvy real estate investor takes that same $100, invests it in a house that doesn’t even require his own money to buy if he does it my way, and gets back $35,000 in only a month or two. Now, THAT’S what I call a return rate! Now that you know one of my many secrets, think about what you can do when you have real money in your IRA. All of a sudden you can make $100 investments in houses while the cash in your IRA simultaneously grows tax free in other investments at 15%, 25%, or even 30% per year, passively with no extra work on your part. in the United States of America, Today! Would you like to know the step-by-step process to do that? Would you like to know exactly how to stuff your IRA full of tax-free cash on a constant and consistent basis? Would you like to sit back and watch $100,000, $500,000, or even $1 million grow tax free day by day, hour by hour before your very eyes? Well, you can do all these things when you know the secrets of the Self-Directed Roth IRA, secrets almost no financial professional knows or wants you to know. Why does your “trusted” financial advisor want to keep this secret from you? The answer is simple. If your IRA is self directed like I suggest, they can’t make any commissions based on trades they make for you. Utilizing the secrets I know, you get to keep YOUR money, money they were filching from each of your transactions. Your IRA will truly be working for you, not for them. No wonder they want to keep this secret from you! Now, don’t get me wrong. I don’t want to imply all accountants, lawyers and financial advisors are evil people who are just out to get their hands on your money. There are many financial professionals who do have your best interests at heart, yet they still encourage you to make low-yield, traditional investments in your IRA because they simply don’t know any better. These Roth IRA secrets are not taught in any accounting program or at any law school or financial institution. Lawyers, Accountants and Financial Advisors Have No Clue About This Amazing, Tax-Free wealth Secret. That’s why even CPAs, attorneys and financial advisors keep the money in their own IRAs in stocks, bonds, and mutual funds. It’s the way they were taught by those who came before them, and they simply don’t know any better. Plus, very few of them are real estate investors, and if they are, they’re the traditional, “buy and hold” crowd, not “transaction engineers” like myself and my successful students. When you talk to one of these professionals about how to make money buying and selling houses my way, you might as well be speaking a foreign language to them because THEY JUST DON’T GET IT. In fact, it scares them. Even when you try to patiently explain how your Roth IRA can buy real estate with little or no money, their eyes glaze over, they refuse to listen, and they continue to hold tightly onto the stale methods they find comfortably familiar. It’s so far outside their normal reality, they actively resist what you tell them and do their best to counsel you against it. Don't Let Their Fear Of Change Keep You From Millions! Quite frankly, I only found out about investing in real estate inside a Self-Directed Roth IRA a few years ago myself, and I’ve never taught it before because I wanted to test it out thoroughly and make sure what my experts told me was really true and could work for my students. IT IS, AND IT WILL! In order to share this opportunity, I decided to team up with the world’s foremost expert on Self-Directed Roth IRAs, the man who found this “secret IRS regulation” for me, and reveal these IRA Wealth Secrets to a few select people via a once-in-a-lifetime seminar. Unfortunately for you, I’ve already put on this riveting seminar, and you missed out. However, there is good news… I recorded the entire seminar, and now, for the first time, my new “How to Get Rich With Your IRA and Never Pay Taxes” seminar is available on CD. Before I get into the exciting details about my “How to Get Rich With Your IRA and Never Pay Taxes” seminar and the amazing product created from it, I want to tell you just a bit about my good friend, “Mr. X.” He truly is the world’s foremost expert on Self-Directed Roth IRAs. Mr. X has been involved in the securities industry for more than 35 years, and he’s currently Chairman of the Board for a financial institution that specializes in self-directed IRAs which is the custodian for over 20,000 Self-Directed IRA accounts, many of which are valued in the multi-millions. My own Self-Directed Roth IRA is with Mr. X, as is my daughter’s and many of my students. Mr. X, who’s been written about in Money magazine, understands my kind of real estate investing, and in fact, is a real estate investor himself. Like I said, he’s the guy who first let me in on the fact that I could buy and sell real estate at huge profits inside my Roth IRA using very little money. That’s why I asked him to speak at this seminar with me. The name of a little known company who will set up your Self-Directed IRA for you following the exact IRS regulations, so you’ll be sure to stay out of trouble (something no lawyer or CPA can guarantee you). This company never recommends an investment, and, therefore, doesn’t get a commission steering you into non- or low-producing deals. The unusual story of how I fused the Self-Directed Roth IRA with real estate investing, creating the ultimate tax-free wealth machine. Why your CPA and attorney don’t know the secrets of the Self-Directed Roth IRA, and, if they do, why they don’t want you to know them. Why you’ll be ecstatic if you get a huge bill from your Self-Directed IRA administrator (the secret company I’ll set you up with). Why you must plan for taxes BEFORE you get rich, and why you’ll hate yourself if you don’t (please, learn from my own heart-wrenching experience). How you really open a tax-free IRA within 24 hours, and the shocking reason why you MUST do so NOW. The little known reason why a Roth IRA is far superior to any other type of retirement plan. How much money will you lose by investing your money outside of a Roth IRA? How your Roth IRA will not only grow for you tax free, but will also continue to grow for your children and grandchildren and make them millionaires too! How to avoid the bad advice that sounds good when it comes to a traditional IRA. Most people make this mistake that costs them millions of dollars without even knowing it. When to convert a traditional IRA to a Roth IRA, and when not to. Do this wrong and you immediately owe the government a huge tax check; do it right, and profit big time. How to transfer a Roth IRA from a traditional broker who will NOT let you make self-directed investments to a “no hassle” one who will and is approved by me, Ron LeGrand. Why a traditional broker or bank will not let you invest the funds in your Self-Directed IRA the way YOU want to invest them, and how to get around it. How to have absolute, iron control over all the investments your IRA makes, and never have to helplessly watching your portfolio shrink as the stock market tanks again. Recently divorced? Here’s something you’d better do with any existing IRA, and do it FAST before your ex profits from your hard work. The unusual reason why you should have “His and Hers” IRAs (if you want a happy marriage, that is). How to get rich without contributing any money to your IRA beyond your initial $200 requirement to open one. THIS is the unbelievable, yet perfectly legal, secret no financial advisor on earth knows about and would call you a liar if you told them about. Should you even bother to contribute to you IRA if you don’t need to? I’ll explain the one good reason you should, and why you may not be able to unless you act fast. How paying your social security tax can make you a tax-free millionaire, and it has nothing to do with social security. Do you make more than $160,000 a year as a couple, or $110,000 as a single? If so, too bad because you CAN’T qualify for a Roth IRA UNLESS you know two secrets, that is! You’ll learn how anyone, regardless of their income, can have a Roth IRA. Wait! There’s a third secret as well, and this one can get you a big, fat tax deduction. The strange reason why earning one half of one percent rate of return on your money within an IRA can make you rich, fast. Asset protection secrets of an IRA. Why most predators can’t touch it even if they get a judgment against you, and the only two predators that can. Should you have more than one Roth IRA? The answer is “maybe,” and while it has nothing to do with making money, it could save you a boatload of it. The unusual reason why you shouldn’t take money out of your Roth IRA when you retire. The amazing “wealth pass along secret” of the Dynasty IRA. Why you NEVER want to do a “nothing down” deal within your Roth IRA, but don’t worry, you can still generate windfall investment profits using a tiny amount of money as long as you know this secret. Why you should never pay IRA administrative fees from within your IRA, and how to get a deduction on your regular taxes by paying them outside your IRA. What to do with your tax advisor if he or she has no clue about Self-Directed Roth IRAs. How to set up a Roth IRA for a newborn baby, and make them a millionaire by the time they get to high school with no investment from you. Step-by-step methods to getting money into your IRA using real estate options and lease options. How to option “paper”, mortgages and trust deeds, within your IRA to make huge investment profits with minimum work. How your IRA can own a business, and why it should! How to avoid “self dealing.” Self dealing is a big no-no with your IRA, and if the IRS thinks you’re doing it, you’ll have to write them a huge check, fast, up to the full amount in your IRA. You’d better learn this rule early in the game. How your IRA can get you both cash to spend now, and cash to grow tax free. How your IRA can partner with your spouse’s IRA on a real estate deal. Do you have an elderly parent or relative you’d like to help out? Here’s how to use a Roth IRA to help them live the lifestyle they truly want, instead of just getting by on a miserable fixed income. These secrets would make Social Security obsolete if more people knew it. How to use a Coverdell Educational IRA account to pay for your kid’s college tuition no matter how expensive it is, and collect a nice tax deduction at the same time. If you have a child you’d like to put through school from birth to age 30 and never write a check for their tuition, travel, books, computers or lodging, you must have this CD! When to fire your accountant or attorney. The seven things you can take money out of your IRA early for without incurring an early withdrawal penalty or taxes. The four things you can do that cause nasty penalties to be levied on your IRA. The nine things your IRA cannot invest in. What will happen to you if the IRS catches you “self dealing” (and it’s not pretty). How to fill out the simple form directing your IRA to make an investment so all the profits from that investment flow back to your IRA tax free. Why you shouldn’t do “subject to” deals in your IRA the conventional way, but you can do them with a little-know, unconventional method that’ll lead to big profits. How to use paper trusts, land trusts and personal property trusts to protect you against sue-happy predators who want to steal every dime you have using the legal system. When to use cash from your IRA to buy real estate and when not to. Why being a “hard money lender” is the easiest, tax-free money you will ever make using your IRA. How to make at least a 30% rate of return, or much, much more, on your IRA’s money every time you make a certain investment that has way less risk than the stock market. What NOT to do with the cash in your IRA. The people who don’t know these “what not to do secrets” get ripped off every single time they make an investment. Why the last thing you want in your IRA is cash! How to contribute up to $41,000.00 a year to an IRA AND get a big fat, $41,000.00 tax deduction at the same time while still profiting from investments in your Roth IRA. Worried about your health? Here’s a neat plan the IRS came up with for you to get your health needs met with tax-free money. If this doesn’t replace your health insurance completely, it will certainly slash the cost of it! Okay, that’s it. You have just read a detailed description of the tax-free wealth secrets on these CDs and what they can do for you. If you’re at all interested in getting very, very rich, these CDs are a must have, and you can’t get the information on them anywhere else, certainly not from your accountant or financial advisor. In addition to the five-CD audio system, you also get the 136-page manual I wrote and passed out at the event. Why should you care about this manual? In addition to covering everything I reveal on the CDs in depth, it also includes all the forms and agreements you need to get set up with a Roth IRA quickly and easily, and show you how to do real estate deals within it so you can make sure the money goes in tax free for life. Free Gift #1: The exact IRS regulations that show you just why you really can get rich tax free. These regulations cover the Roth IRA, SEPs, Coverdell Educational IRAs, and Health Savings Accounts (HSAs), all of which are entities you can grow tax-free wealth in. With this manual you’ll have the letter of the law on your side, and you can take comfort in knowing your tax-free wealth is perfectly legal. I call it your “shut up” book, because we refer to it regularly on the CDs to cite the law in case you need to show it to your CPA or other advisor who wants to challenge your use of your IRA from a position of ignorance. Free Gift #2: Proven Wealth Building Secrets Manual by “Mr. X.” As you recall, he’s the guy who showed me all the tax-free wealth secrets and the #1 IRA Expert in the country. In fact, his company is the one I use to administer all my IRAs, and he can get you set up with your own Self-Directed IRA, just like me. In this easy to understand manual, Mr. X reveals every secret there is to using all the IRA entities to build permanent and lasting wealth for you and your family, plus he provides you all the forms you need to get your Self-Directed IRA set up with his company, just like me. His company makes it so easy to get correctly set up with whatever IRA you choose. They literally do it all for you, and this manual shows you step by step how to get started. This $49.00 value is yours FREE when you order now. Now, unlike many publishers, I take pride in how my product looks. Your studio-quality recorded CDs will arrive speedily in professional packaging and ready for you to use. By now you’re probably asking yourself, “OK, Ron, how much is this System going to cost me?” First of all, you shouldn’t be thinking in terms of cost, you should be thinking investment. How much is it worth to you to know how to use your IRA to get rich and never pay taxes? I can assure you, millions, literally. How much will it cost you if you don’t have this information? Again, the answer is millions. Think once again about our earlier example about doing one deal inside your Roth IRA versus that same deal done outside of it. Within a Roth, you can turn a house over instantly, keep all $35,000 profit, and immediately put that money to work to make more money within your Roth. Outside your Roth, you won’t get neat the same rate of return, and if you could, the least you’ll pay in taxes is $5,250.00 (if you hold it for a year and count the profit as a capital gain). If you turn it over immediately you may pay as much as $12,250.00 if you’re in the top bracket of income tax payers. All it takes to do a deal inside your Roth IRA is a few simple pieces of paper, but those pieces of paper are, obviously, worth thousands. To be blunt with you, there really is nowhere else you can go to discover these secrets. Accountants don’t know them, lawyers don’t know them, and financial advisors don’t know them or if they do, they don’t want YOU to know them. It took me, even with my many connections across the county, a long time and lots of money to discover them on my own. So, to save you the trouble and money and get you started on your way to tax-free millions, I’m going to charge you a fair price, not an exorbitant one. At first, I thought about charging the minimum you’d save in taxes on an average “pretty house” deal, $5,250. Now, while I do think that is a very fair investment, I’m not going to charge you that much, or anywhere near that much. In fact, the investment for my How to Get Rich with Your IRA and Never Pay Taxes System is only $497, much less than you’ll save in taxes on just one, tiny deal within your IRA. BUT, when you order online now, I’ll give you a fast action discount of $200, bringing your investment down to only $297, an instant 40% savings. 30-Day Unconditional satisfaction, 100% Money-Back Guarantee. All you have to do to get your hands on this System is fill out the form below below. The information you’ll receive on the CDs is information you can’t get anywhere else, certainly not from your lawyer, financial advisor, or accountant, and you don’t want to miss out. You should also know I’m not planning on re-ordering any of these CDs for a long time, so to be sure you’re not left out, you need to act NOW! Also, keep in mind, when you order now, you will be able to claim the generous 40% discount, AND your two bonuses. All of this for only $297! How much money can this small, one-time investment of $297.00 make you? Like I said, if you only do one deal, one time within your Roth IRA, at the average profit my students make on a house, $35,000!, the minimum amount of money you’ll keep via tax savings is an extra $5,250. That’s a 1,056%, no-risk return on your investment which is already secured by my unconditional, 30-day, money-back guarantee. Keep in mind, that’s IF you only do one deal one time, but I’m betting after you do it once, you’ll want to do it over and over again, and your return on investment will be near infinity. How much more money will that put in your, your children’s and your grandchildren’s pockets? 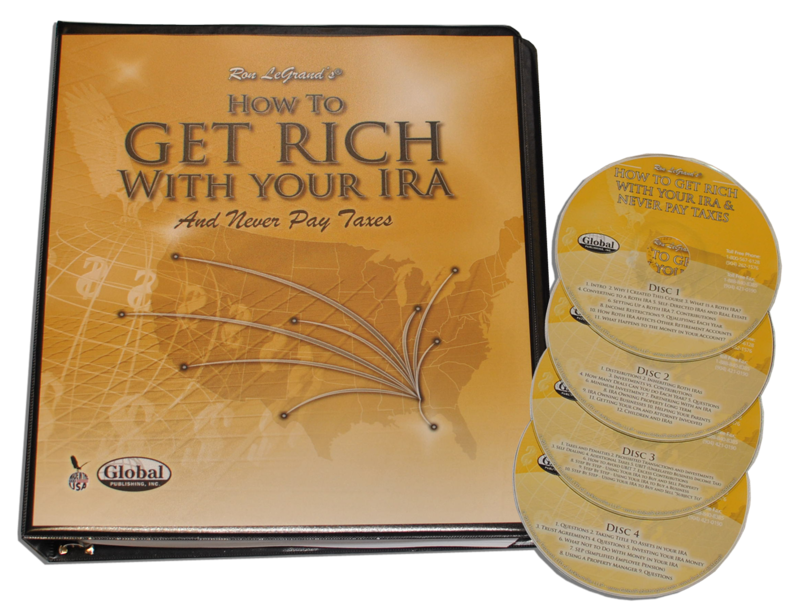 In comparison, the investment for the How to Get Rich with Your IRA and NEVER Pay Taxes audio CD System is tiny, in fact, I can think of no reason whatsoever you wouldn’t jump on this right now before another second passes. Don’t hate yourself for passing up tax-free wealth every time you do a deal or write another large check to Uncle Sam; just put the secrets in this remarkable System to work for you, and smile all the way to the bank. I’m genuinely looking forward to sharing these tax-free wealth secrets with you and helping you keep every penny you earn, and I welcome you to join me in living a lifetime of financial success. Stop overpaying the government when you can legally pay yourself everything – Get started now, before it’s too late. P.S Take just one more moment to imagine how comforting and exhilarating it will be watching your wealth grow year after year, tas free, and knowing you and your family are secure for life because you took action and discovered IRA wealth secrets few other real estate investors will ever know. Now, stop imaging that kind of life, order my system and get started living it now.